BEST 1 BR LAYOUT ON BEACH...WITH PRIVATE BUNK AREA. ALMOST ANOTHER BEDROOM. BEAUTIFULLY DECORATED,NEW VINYL PLANK FLOORING; This condo has it all ...centrally located right off of Thomas Drive, close to shopping, dining, entertainment, and St. Andrews State Park! Walk next door to Schooners for Dinner & Entertainment....a real plus !! This ocean front condo features one bedroom, two baths, the bunk area & a LR Pull out Sofa, so it will easily sleep 8 people comfortably ! 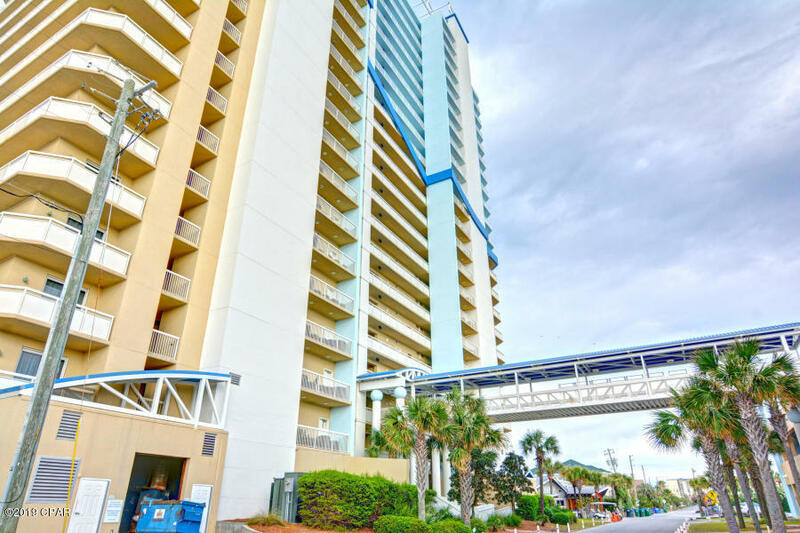 This condo features 9' ceilings, ceramic tile flooring, a breakfast bar, and a private balcony for your morning coffee or afternoon cocktail while enjoying a priceless ocean sunset ! The unit is being sold fully furnished with the exception of some pictures and the balcony furniture.